Just Write For Kids is all about community and inclusivity. It’s about sharing inspiration, achieving goals and reflecting what’s needed in the world. As we grapple with some conflicting issues in today’s world, we also infuse ourselves with love and hope, and a fighting spirit for peace. March 21st marks the celebration of Harmony Day; a day of coming together in all of our country’s cultural diversity and eliminating racial discrimination. I would like to share a few picture books that encourage respect, belonging and the openness to different kinds of diversity that are important for reinforcing acceptance for our younger generation. Grey-Glasses-Itis, fourth in the ‘Lessons of a LAC’ series, is a gorgeously simple story about the strength of perception and the value in managing one’s emotional resilience. The merit in seeing the bright side of life, in amongst the darkness, is certainly a powerful message for today’s youth. Practising clinical psychologist, Lynn Jenkins, penned this book as a way to express to readers that ‘there is a connection between how they think and how they feel – and giving them a strategy to help manage those feelings’. Feelings are cleverly highlighted in the form of colour in this tale about Loppy the LAC and his emotional expression through painting and admiring the hues of the world around him. But when he tries on the grey glasses from friend Curly’s colourful collection, Loppy’s world, and his feelings, quickly turn dull and lifeless. Curly promptly reminds LAC that he has a choice. Can he make the shift to revert back to his bright, happy self? 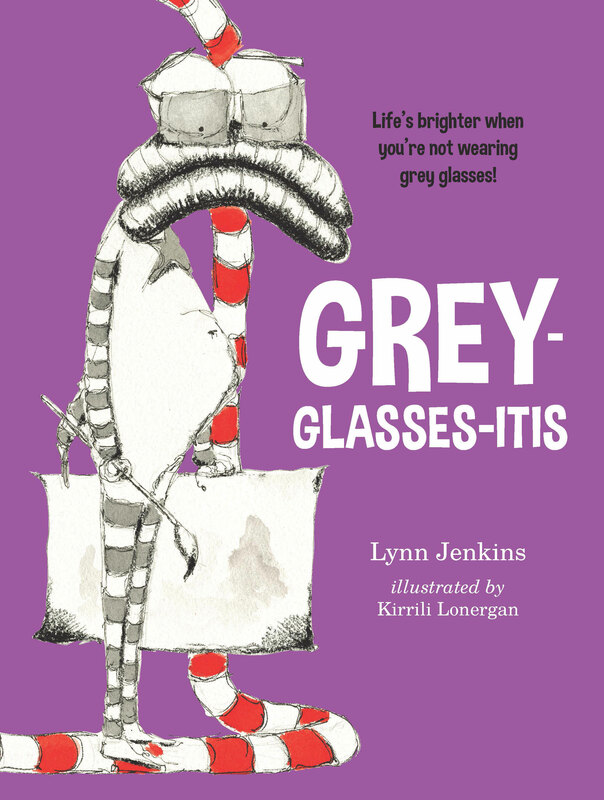 With stunningly perceptible illustrations by Kirrili Lonergan; her carefully selected pops of colour in all the right places, Grey-Glasses-Itis is highly interactive and energetic (even in the sad parts). This book is a truly valuable resource for children from age four. 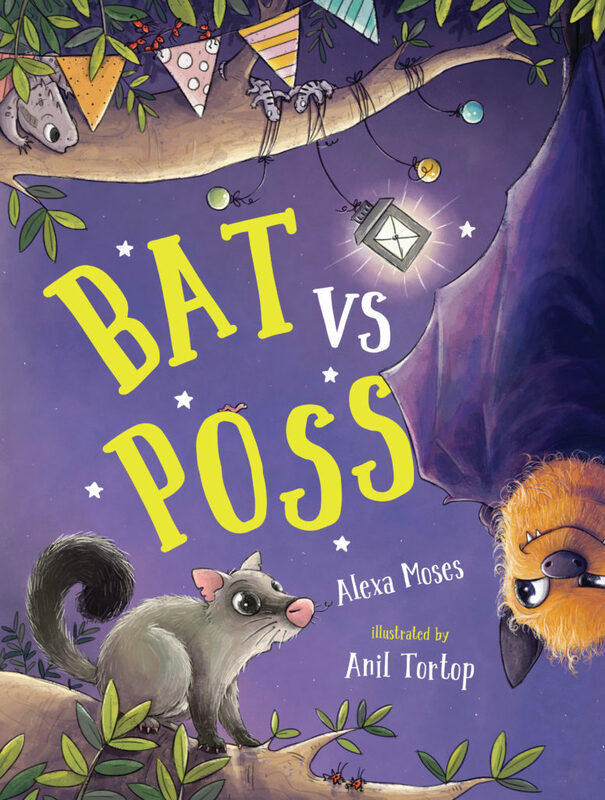 A delightfully entertaining tale about inclusivity, belonging and the acceptance of diversity is Bat vs Poss by Alexa Moses and Anil Tortop. ‘Intruders’ are generally not welcome. But in this book, we see that with a different mindset, a little compromise and friendship can create a harmonious balance. In this case, a fruit bat decides to mark his territory in the same paperbark tree as poss and her sisters three. Yes, he is rude and obnoxious, and makes a stinking mess. The possums are kicked out and it becomes a communal quest to get rid of this nasty home-invader. In delectable rhyme and scrumptiously adorable illustrations, the high-powered energy is ramped up to the max! Bat vs Poss beautifully highlights the juxtapositions of shade vs light, dusk vs dawn, and dispute vs harmony. Living in peace doesn’t mean we always have to agree, but sharing, respect and kindness can certainly go a long way. Highly recommended for pre-schoolers and beyond. Lothian Children’s Books, Hachette, January 2019. Not so much about cultural diversity but certainly a book of ‘bold’ colour. Wrestle! celebrates family and identity from the inspiration of award-winning documentary, Gayby Baby; stories of children raised in LGBTQIA+ families. 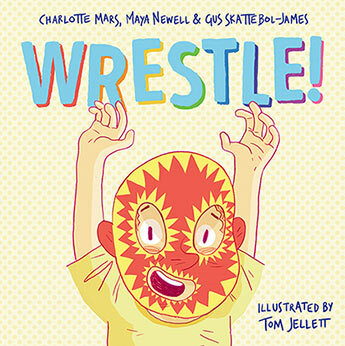 These children are reflected in this book about the fight to be whatever you want to be, whether that’s a wrestler, a unicorn or a pop star. Charlotte Mars, Maya Newell and 17-year-old Gus Skattebol-James proudly stand to expand the conversation surrounding family, sexuality and gender through their fun story about dressing up for the upcoming Mardi Gras. Young Gus is as keen as mustard to go as a wrestler. He loves wrestling ‘more than every tiny little grain of sand in the world…’. Despite his mums’ disagreement, Gus is convinced, and convinces his little sister, too…until she gets hurt. That night he has a dream, and a new idea comes to fruition. He can still be a wrestler…but in his very own way. Perfectly chosen illustrator, Tom Jellett, brings his wit and sensitivity, texture and depth to this charismatic tale. No more ‘wrestling’ with self-identity… Wrestle! empowers readers to open their minds, and to love. Allen & Unwin, February 2019. There’s been a lot of talk on ‘building a wall’ surrounding issues on refugees and immigration in certain parts of the world. Matt Shanks takes a stand with this topical theme about a girl in a powerful position to separate her kingdom from the rest. 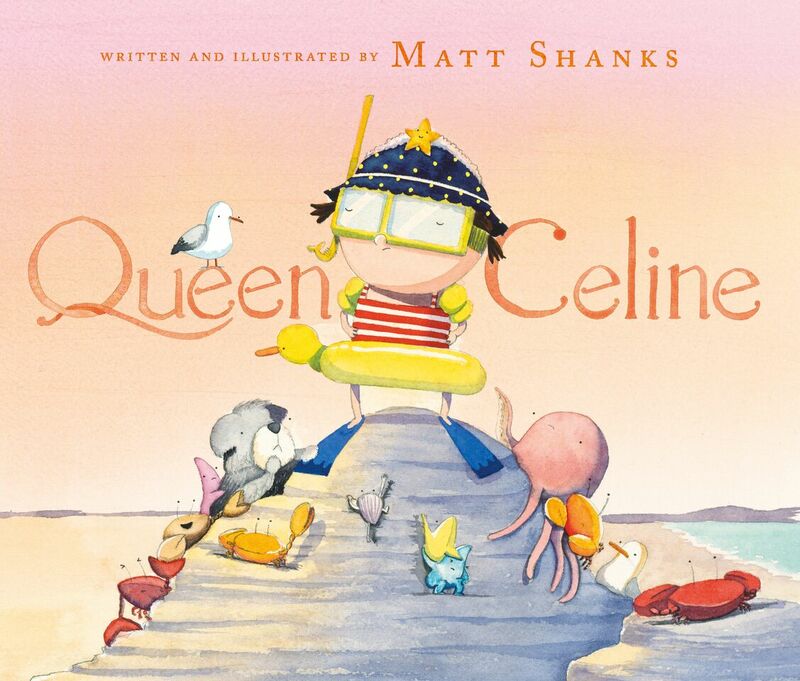 Most of the time, Queen Celine is an ordinary girl. But sometimes, she owns a kingdom by the sea. Pretty soon, Queen Celine decides she must pick and choose what makes her kingdom the most beautiful, and builds a stone fortress to protect it. As you might guess, Celine forbids intruders to enter. She believes she is ‘the greatest leader that ever lived’. Until her kingdom begins to lose its sparkle, and subjects leave in search for a better life. Queen Celine soon realises her royal mistake; a strong political message thrust to those in favour of the fight. Despite its serious undertone, Shanks delivers this story with a magical beauty and undeniable sweetness with his cute characters, gorgeous pastel tones and innocence in the text. Oh, and there is a happy ending! Queen Celine is all about encouraging inclusion and diversity, as well as a nod to preserving our biodiversity, and giving those in need a place to belong. An important book to share with children from age four. Posted in Book Reviews, Just Write For Kids, Romi Sharp Tagged Alexa Moses, Allen&Unwin, Anil Tortop, Bat vs Poss, belonging, biodiversity, Charlotte Mars, culture, diversity, EK Books, emotions, environment, family, friendship, Gayby Baby, Grey Glasses-Itis, Gus Skattebol-James, Hachette Australia, harmony, identity, inclusivity, Kirrili Lonergan, Lothian Children's Books, Lynn Jenkins, Mardi Gras, Matt Shanks, Maya Newell, political, Queen Celine, Resilience, respect, sharing, Tom Jellett, Walker Books, Wrestle! ← WIN! An Intriguing History – Follow After Me Book Giveaway!